In Ohio Coal Country, Job Prospects Lie With Neither Coal Nor Trump's Promises Donald Trump has made huge promises for creating coal jobs. Not many really think he can deliver. Instead, hopes are high for a new plant in Ohio that converts natural gas into plastic pellets. Coal miners return to work near St. Clairsville, Ohio, after a month's shutdown during union contract negotiations in May 1941. 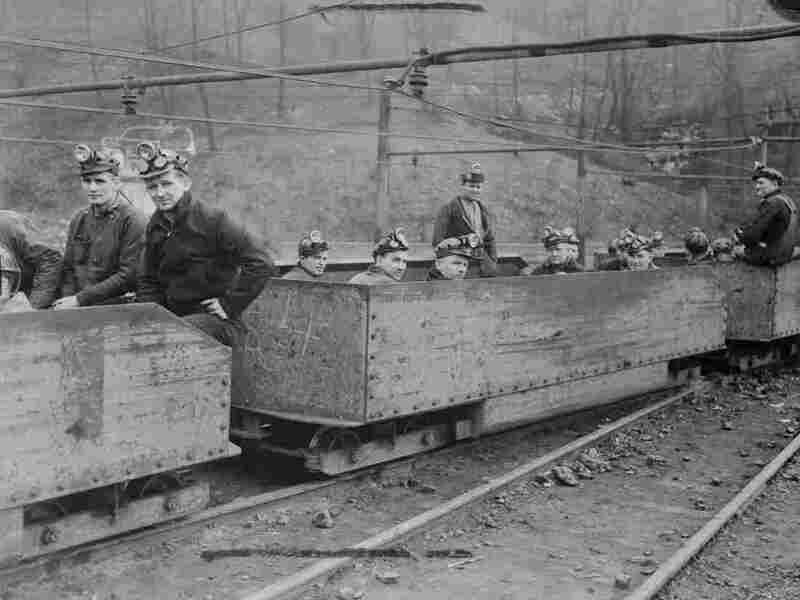 For decades, coal has fueled the economy in Belmont County, where St. Clairsville is located, and beyond. The path of the Ohio River snakes southwest out of Pittsburgh and forms the border between Ohio and West Virginia. Here, the foothills of the Appalachian Mountains rise along its banks, and beneath that Appalachian soil lie the natural resources that have sustained the valley's economy: coal — and now, natural gas. To people far away, who consume goods made with energy fueled by the Ohio Valley, coal and gas may be harmful agents of global warming. But to people in Ohio coal country, a good life on the ground is paid for by what's underneath it. And when Donald Trump made a "Thank You" victory tour appearance in Cincinnati this month, he said what many of them want to hear. "On energy, we will pursue energy independence and cancel the job-killing restrictions on the production of shale energy, oil, natural gas and clean coal, and we're gonna put the miners of Ohio back to work," he told the cheering crowd. Across the Ohio River from Powhatan Transportation Center — owned by Murray Energy — is a power plant that services mines in West Virginia. It's not hard to find Ohio miners who want to get back to work, people like Eric Matthews. 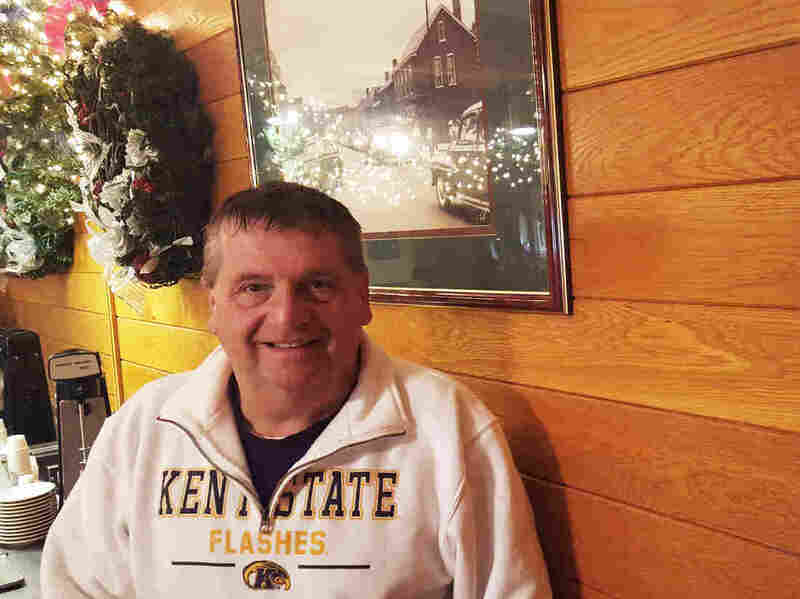 Matthews, 37, was laid off from his job at Murray Energy in Shadyside, Ohio, in November. His employer declared his coal mine spent and shut it down. Matthews was born and grew up along the Ohio River in Belmont County, where the Shadyside mine is located. After working for an engineering company in Columbus and getting an associate degree there, he came back home and took up mining in 2010. The job came with a good union contract: time and a half on Saturdays, double time on Sundays, triple time on holidays and birthdays, and an attractive insurance package. In his best year, Matthews says, he made about $90,000. He feels hopeful that his seniority will land him a job at one of the company's West Virginia mines. The prospects outside mining aren't nearly so attractive. A neighbor of Matthews' who is a bit younger was also laid off by the same coal mine; he recently got a job with the local water department. The pay is only a fraction of what the men previously earned in mining. "He actually told me the other day that he makes less at his job now than he did when he was on unemployment," Matthews tells NPR's Robert Siegel. Matthews, who says he usually votes Republican, voted for Donald Trump. In fact, Belmont County — which is historically Democratic — went overwhelmingly for Trump. Trump's promise to bring back jobs in the coal mines helped him win comfortably in Ohio, surprisingly in Pennsylvania, and predictably in West Virginia. But Matthews says he voted with little hope that Trump can bring back coal jobs. "It's sort of one of those things where everybody says what they think you want to hear," Matthew says, adding that he thought Trump would be able to do more for coal miners than Hillary Clinton. Coal from neighboring mines arrives at the Powhatan Transportation Center by train and truck. 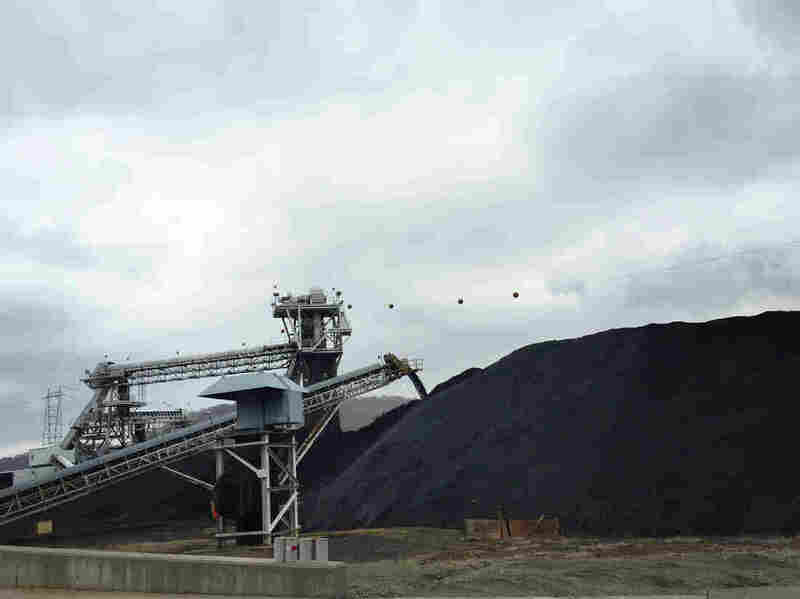 The coal from this stockpile goes onto a conveyor belt and drops down a chute before being loaded onto a barge for distribution across the Ohio River. In this coal mining region of Ohio and neighboring West Virginia, where most families have some history of working in mining, people speak of a war on coal. The market of coal consumers is rapidly shrinking as utilities convert to natural gas. In 2008, coal-fired plants produced 48 percent of the country's electricity. Last year, it was down to 33 percent. Bob Murray is a commander of the side defending coal. 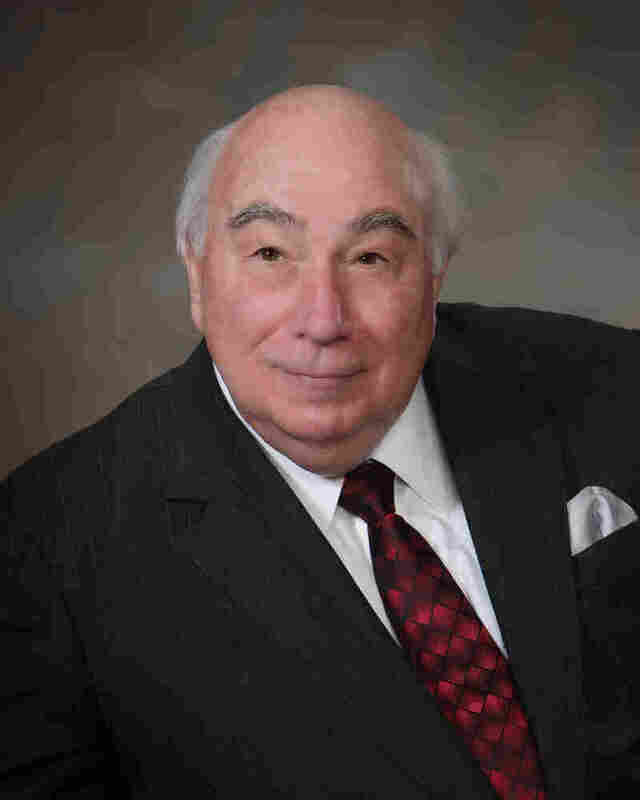 He owns Murray Energy, Matthews' old employer and the country's fifth-biggest producer of coal. On May 1, 2015, Murray says, his company had 8,400 coal miners. "Because of the destruction of Barack Obama and his administration, that number has dropped now to less than 6,000," he says. Murray is a larger-than-life character in the coal business. At age 76, he is battling lung disease that is likely related to the years he spent in the mines. He blames the Obama administration's regulations — limiting emissions of mercury and air toxics, for example — for driving the push to natural gas. He rejects scientific evidence of global warming or any contribution to it by burning fossil fuels. Murray supported Trump and says Trump can bring back coal jobs if he takes several steps: end the emissions regulations, withdraw from the U.N. climate change agreement — which Murray says "basically is an attempt by developing countries to get American money" — and end subsidies for windmills, solar panels and other forms of renewable energy. Murray took the U.S. Environmental Protection Agency to court to block clean air regulations and won a stay. He says that Trump should name a Supreme Court justice who will block presidential excesses and should fire Justice Department lawyers whom he describes as criminals. And that's not all. "He needs to eliminate one-half of the employees in the U.S. Environmental Protection Agency. He needs to cut the staff drastically in the Department of Interior. He needs to eliminate the Department of Energy altogether," Murray says. He thinks much of this can be done in a matter of two or three months. And if that happens, Murray says he can have a couple of thousand people back at work by spring at his now idle mines. But even Murray, the crusader against the so-called war on coal, concedes this: So many coal-fired plants have shut down that the promise of more coal mining jobs will be hard to keep. "I've told Mr. Trump to caution and temper his statements about bringing the miners back to work," Murray says. In fact, the big talk of new jobs in Belmont County, Ohio, isn't about coal at all. It's about natural gas — and things you can make from natural gas. Thailand-based PTT plans to build what's known as a cracker plant, which converts natural gas — that would come in by pipeline — to plastic pellets. The process breaks down — cracks — molecules of ethane. When PTT gives the final go-ahead, expected in the first quarter of 2017, new jobs will start coming. Democrat Mark Thomas, one of Belmont County's three commissioners, is excited about the big construction project that's almost certainly coming to the county. A major construction project expected in Belmont County — a plant that converts natural gas to plastic pellets — will bring thousands of jobs to the area, says Democrat Mark Thomas, a county commissioner. "This project here is probably going to be the largest economic development project in monetary terms ever in the state of Ohio," he tells a weekly luncheon of the Kiwanis Club in Wheeling, W.Va., just across the Ohio River from Belmont County. Thomas estimates that construction of the plant will take four to 4 1/2 years and create thousands of jobs. On top of that, Thomas says, the cracker plant itself should create 500 to 600 jobs, and if all goes as expected, other factories — with even more jobs — will go up nearby. Thomas says the county has already received more than a dozen calls from companies that use plastic, like a regional dairy that uses plastic milk jugs made at a plant in Nebraska. The Kiwanis Club members had questions about the cracker plant. Blake Williams, who grew up near a paper plant and remembers the fumes, expressed environmental concerns. "These plants do come with, call it, pollutants," Thomas responded, "but those pollutants will be governed, if you will, and or regulated by Ohio EPA and the U.S. EPA." The federal EPA, Thomas told the group, has experience with cracker plants in Louisiana and Texas, where they're located close to offshore gas fields. One Kiwanian pointed out that the region's boom-and-bust cycle of building pipelines and drilling for gas attracts workers, drives up rents and forces some tenants to the streets. Thomas answered: Government cannot do very much about that. For the Belmont County commissioner, the pluses of the cracker plant far outweigh the minuses. A coal-fired power plant once occupied the site on the Ohio River where the new cracker plant would be built. Unlike in nearby Pennsylvania, where the mountaintops are dotted with windmills, there are none to be seen here. This is fossil fuel country, whether the fuel is coal or gas. 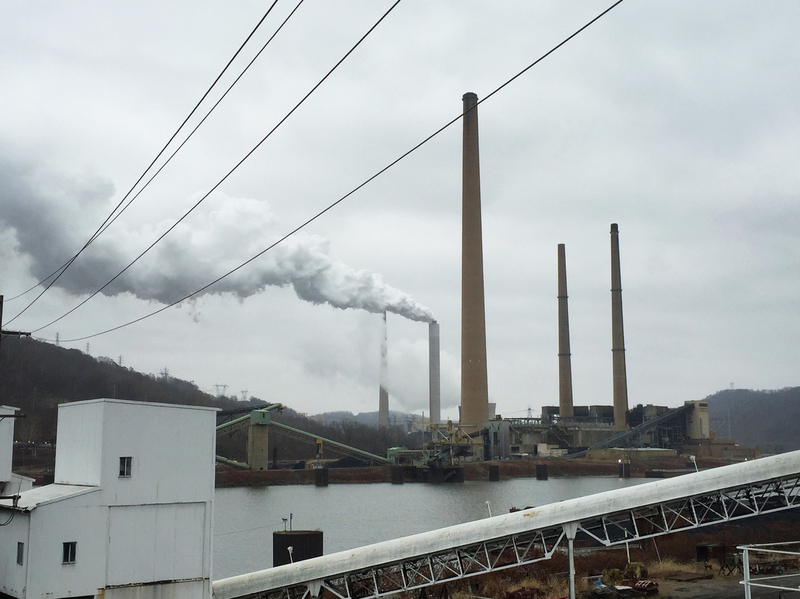 Going back 60 to 70 years, the coal-fired power plant offered hundreds of living-wage jobs with benefits that helped the Belmont County economy tremendously, says Thomas, the county commissioner. But a transition is underway in Belmont: from the old coal and steel economy to the new natural gas and plastic economy. "Coal has been a great friend of Belmont County. And still is to this day. The coal industry is on hard times," Thomas says. "What we're trying to do as elected officials here in the region and in the county is accept where we are with that industry and embrace the new industry." Barring some unforeseen obstacle to the cracker plant's breaking ground, there will be jobs coming to Ohio coal country soon. They won't have much to do with Donald Trump's promises or policies — and they won't have much to do with coal, either.